I competed recently in an olympic distance triathlon where I relied on minimal footwear for the run leg of the race. I’ve been wearing, training, and living in minimal (or no) footwear since early 2010 and doing a significant amount of barefoot running as well, but it’s not something I typically do in a competitive, race situation. Why go minimal in a race situation? Running in minimal footwear or barefoot is something I do primarily for orthopedic purposes, to reinforce good biomechanics and build strength in lower legs + feet + ankles (actually, it boosts everything from your hips on down). It also promotes better running efficiency, and this is something that can come in handy in an endurance event. On top of all that, it’s just plain fun! Out of three triathlons I’ve done so far this season, wearing minimal shoes, I’ve podiumed in my age group in all three. In my most recent event (Tri Santa Cruz, olympic) where I wore the Luna Sandal “huaraches” (pictured above), I actually won my age group — something I’ve never done before in the 12 years I’ve been doing triathlons, large or small. 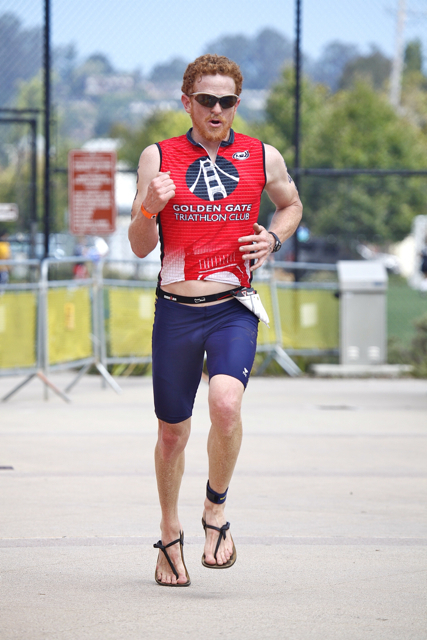 Other triathlons I’ve done this year include a 3rd place age group (AG) at the Treasure Island (sprint) wearing VFF Trek Sport, and 3rd place AG the Tiburon tri wearing the Luna Sandals. Such a close affiliation with podiums is not usual for me. Some of my recent success can be attributed to experience & perhaps some field attrition, but I feel a significant amount of it is due to my choice of footwear in which I train. In these recent triathlons, my run leg has been the deciding factor, with some stronger swimming happening, too. Historically, my bike leg has been my strongest, but I’ve been doing less bike training these days focusing more on running. Also note that I’ve been riding the same bike for the past 10 years, so a change in cycling technology or training cannot account for my recent results. But, one may wonder: would I have been as fast (or even faster) had I wore conventional shoes during these races? My guess is that I probably would have been about the same. However, I feel certain that my speed would have suffered had I not been training in minimal shoes like I’ve been over the past 1.5 years. My weekly run mileage this summer has been only ~10 miles (I’ve been laying low due to a foot injury in May-June — more on that later). A minimal footwear training session helps pack in more focused intensity into a shorter period of time — a precious commodity with wife + kids + job. There’s quite a few choices of sporty minimal shoes out there, and I credit Vibram Five Fingers with getting me into this business. I raced in the VFF Bikilas once or twice last season, and in the Trek Sport this year at the TI Sprint. Excellent shoes. Lately though, I’ve become fond of Luna Sandals w/ elasticized leather laces which I wore at Santa Cruz and in Tiburon this year. Compared to VFFs they let your foot breath (important in summertime) and they are quicker to don (important for transitions in a triathlon situation). T1: Stronger feet (& tougher skin) from barefoot running has permitted a faster run during T1 (swim-to-bike) which can entail a significant distance on city streets & other pavement (~0.5 mile at the Tri Santa Cruz). There’s no need for me to put on shoes to run to the bike transition, as some folks do. I can just gun it over the asphalt without a second thought. (Though usually I’m more cardio-limited and can’t run fast until my swimming engine shuts down). Swimming: I know it may sound odd to say that barefoot running can help your swim stroke, but I feel there is a connection. My swim has improved significantly since I’ve been barefoot/minimal running, and I think part of this is from the improved leg strength due to the running. I’ve felt more leg endurance and kick strength in the pool, which helps improve body roll (I’ve also improved my core strength, which helps swimming mechanics as well). As for handling the intensity of training/racing in minimal footwear, there’s always a new level of soreness after a race or a longer/harder workout that my body needs to adapt to. But I’ve been extremely patient and allowed for plenty of recovery time so that the little nagging pains don’t flare into major injuries. This is something I can’t recommend strongly enough to anyone tempted to follow my example. Being a triathlete & cross-trainer makes it easy to shift to a different sport when I need a break from running. 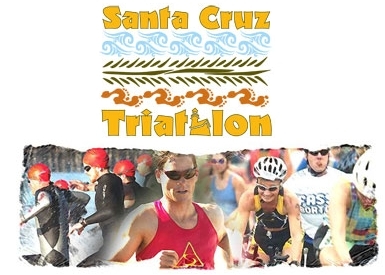 I’m racing in Santa Cruz again on Sep 25th. Stay tuned for details. For the Santa Cruz olympic triathon on 9/25/11 I decided to run in my more conventional trainers (Asics Gel Tarther) to provide a comparison to my effort in the sandals from the previous month on what is virtually the same 10K run course. My time for the run leg was nearly identical (43:41 in sandals vs 43:45 in shoes) — in-line with my suspicion above that choice of footwear on race day doesn’t make a big difference (assuming adequate training). The SCT field on 9/25 was an order of magnitude more competitive than the 8/14 event where I won my AG, so no podium for me this time, though I did manage to hit my target of finishing in the top 10 of my AG. I also competed in the Cal triathlon club’s Bearathlon on Oct 8th, a race which has a penchant for hilly courses (which vary almost yearly). 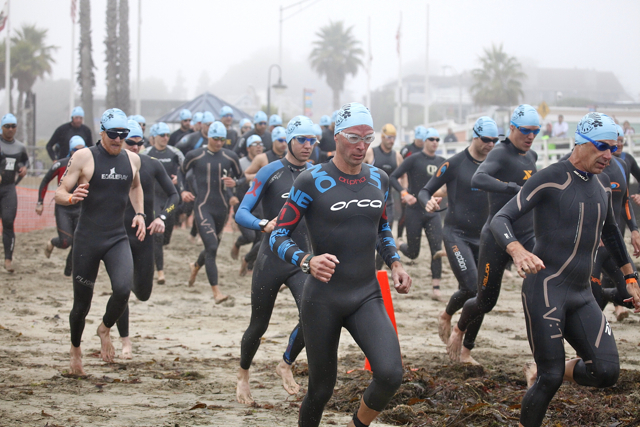 This year’s olympic course was held at Lake Temescal just after some heavy rains which had the effect of raising the bacterial count in the lake to unsafe levels, so they canceled the swim and made us run around the lake twice instead, turning this tri into a duathlon. I ran in the Luna Sandals for both run legs of the Bearathlon which featured copious vertical: the loop around the lake featured a big off-road hill (a little rocky) and the 10K run (mostly on streets) had close to 1K feet of total ascent — this after a bike course with ~2K’ of ascent. Extensive downhill running was tough in the sandals since one cannot rely on rear foot striking to absorb the added impact when barreling downhill. The strap at the front of the sandal in between the big and 2nd toe was working overtime — the focussed pressure here was not something I was used to, primarily from a stability point of view, not abrasion (though the pressure was becoming annoying). Increased leg turnover (cadence) helped cope with the hills.